A Saint With A Mixed History: Junipero Serra's Canonization Raises Eyebrows : The Two-Way Pope Francis announced he will elevate the influential missionary to sainthood when he visits Washington, D.C. But Native American groups say Father Serra was far from saintly. A postcard of Junipero Serra from around 1915. Pope Francis recently announced that he will canonize Serra when he travels to the U.S. this fall. 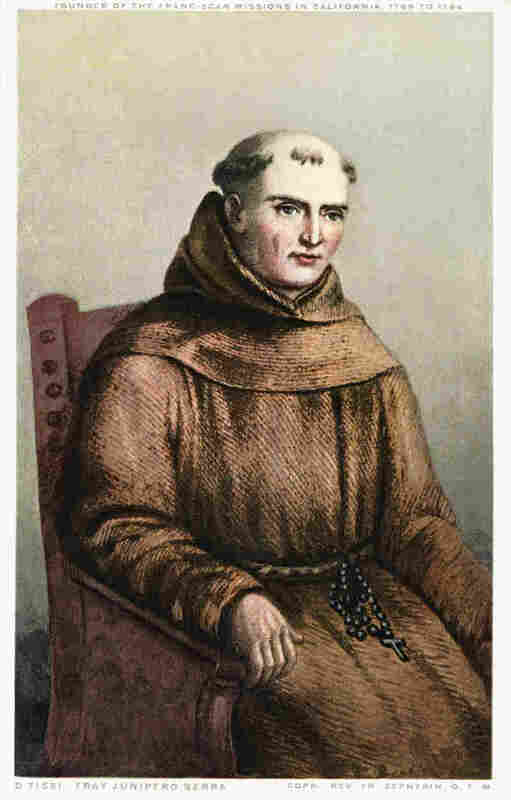 The name Junípero Serra is well known in California: Schools and streets are named in his honor, and statues of the 18th century Spanish missionary still stand. But Native American activists are far less enamored with the friar, saying Serra was actually an accomplice in the brutal colonization of natives. They object to Pope Francis' recent announcement that he will canonize Serra when he travels to the U.S. this fall. Addressing the controversy, Francis X. Rocca, Rome bureau chief for Catholic News, told NPR that Pope Francis has made a point of canonizing famous evangelizers. "And he picked someone who was a Spanish speaker," Rocca pointed out. "That might be his own background as a South American, but also reaching out to the growing part of the Church in the United States who is Hispanic." Serra, a Franciscan friar, founded the Mission of San Diego in 1769. As the Spanish army built fortresses nearby, he moved north, creating eight other missions all the way up to the San Francisco Bay. As the Spaniards pushed through California, so did diseases, which wiped out large numbers of the native population. Tribes were pushed to convert and to live in the missions, where they where taught to farm. Those who disobeyed were severely punished. It was not unheard of for someone to be whipped to death. Professor Steven Hackel of the University of California, Riverside, is the author of Junípero Serra: California's Founding Father. "Serra believed that Indians where children," he said. "That they where a primitive, impoverished, hungry and naked people, mired in superstition and the silliness of their grandparents." But others take a more nuanced view of Serra. In an interview with The Guardian newspaper, author David McLaughlin, founder of the California Mission Resources Center website, described Serra as a "talented but flawed man of his time" who "lived an exemplary religious life by the terms of his day." The article also quotes Father Tom Elewaut, a priest at San Buenaventura Mission, who said that while colonialism was a tragedy, "Serra was a protectorate of the Native Americans." Several historians say that Serra challenged those who sought to enslave the Indians. Deborah Miranda, a literature professor at Washington and Lee University in Virginia, is a member of the Ohlone-Costanoan Esselen Nation of California. Her book Bad Indians: A Tribal Memoir is a compilation of stories related to her own family's experience with California missionaries. Miranda told NPR that Serra turned a blind eye to the abuses Native Americans suffered. "But he didn't put a stop to it," she said. "I think he was very ambitious and very much caught up in the opportunity to create a civilization. He was playing God in a way." There are other Latin American historical figures the pope could choose to canonize, said Miranda. Why not pick Bartolome De Las Casas, a 16th century bishop who was vocal about atrocities against Native Americans? She also suggested Francis consider Monseñor Óscar Romero, who criticized the Salvadoran government's human rights record during the country's civil war and was assassinated. These are issues the pope may soon have to address. Before his trip to the U.S., he's scheduled to go to several Latin American countries — Bolivia, Paraguay and Ecuador. All three have large indigenous populations. Rocca of Catholic News points out that Bolivia's President Evo Morales is particularly outspoken about indigenous rights and may press the issue. University of California professor Hackel says that the way the canonization process is unfolding is unfortunate. "I think they have the obligation to acknowledge what missions meant for California Indian people," he said. "I think they have an obligation to have a debate and discussion, and even solemn moments of reflection, and perhaps even [an] apology."